Action/Adventure//Horror, USA, 2017, 115 min. Synopsis The story follows Navy Seal Tyler Colt and his mission in the Iraqi desert to find a group of terrorists hiding out in a bunker. To his and his team's surprise, the terrorists within the bunker turn out be nothing more than some grave robbers who have all magically died. Upon entering the bunker Tyler and his team also succumb to some mystical forces out of their control. They soon realize the bunker they have infiltrated is actually a centuries old tomb. Mayhem erupts as all the Navy Seal members start turning on one another and are captivated by the forces within the tomb. Tyler is the only one to make it all the way deep within the tomb alive to find a black iron sarcophagus. It's marked with Egyptian symbols like the Ankh and Eye of Horus. Here Tyler is entreated by the forces to open the sarcophagus and release what is inside. But after placing his hand on the sarcophagus, he is immediately stabbed in the palm with a star shaped symbol. From then on Tyler's mind is cursed with visions of Ashurbanipal, King of Assyria... 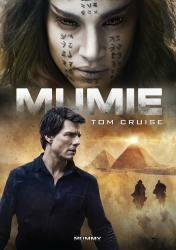 The Mummy.